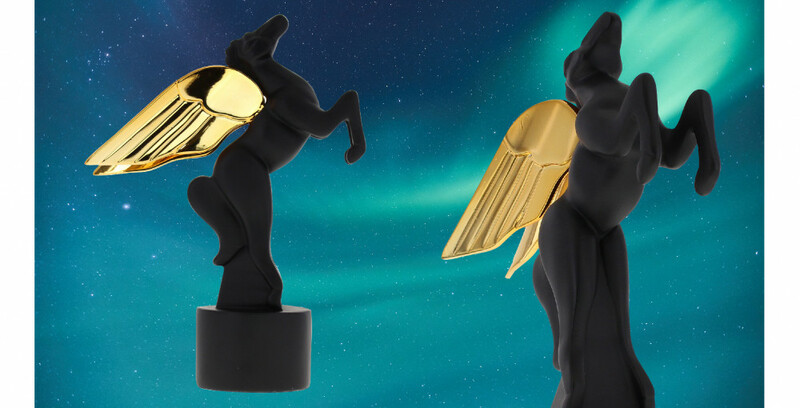 Size: 11-3/4" x 3-3/4" x 3-3/4"
The new, larger Deco Pegasus trophies join our signature line of pegasus awards. Crafted in high-end resin, the form comes to life with striking detail. The iconic winged horse trophy measures 11-3/4" tall and has an ultra modern matte black finish. The original Deco Pegasus awards are still available in Charcoal, Gunmetal or Silver plated finishes and measure 9" tall. If you require additional assistance or prefer to place your order by phone, please contact us at 646.290.7448.